Strategic alternatives could help bring out value in this timeshare stock, but beware of coming regulations. What: Shares of Diamond Resorts International Inc. (NYSE:DRI) jumped 11.5% in March, according to data provided by S&P Global Market Intelligence, as the stock's volatile ways continued. 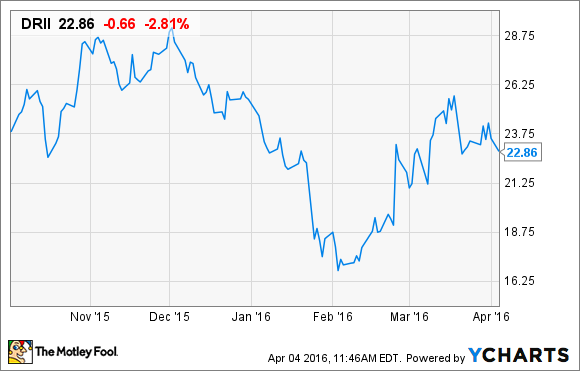 So what: Since the beginning of February, shares of Diamond Resorts have been on a tear. Early in the month, shares surged because management said it would look at "strategic alternatives to maximize shareholder value." But that pop didn't last long. The Consumer Financial Protection Bureau launched an investigation into competitor Westgate Resorts' sales and financing tactics, which could spread to the rest of the timeshare market. If that means regulation into sales, fees, and third-party sales, it could pinch margins for the industry long term. Now what: Diamond Resorts' shares may have been up last month, but they've been on a long-term downward trend that should have investors concerned. If regulators do start cracking down on the timeshare industry, we could see the days of massive margins and captive customers evaporate. Shares may look cheap today at 10.7 times trailing earnings, but beware the decline in profits that could be ahead if Westgate Resorts is just the start of the timeshare crackdown.